January 7, 2019 (El Cajon)--The El Cajon City Council is set to get back to work headfirst after nearly four weeks of holiday vacation on Tuesday afternoon at 3 p.m. Among other items, Council will be addressing free speech by citizens at open comment session, blocking the development of a previously shuttered illegal marijuana dispensary, and regulating dockless vehicles within city limits. October 19, 2018 (Alpine)--Come for a wild and ghoulish night under the stars with the rescued exotic animals of Lions Tigers & Bears in Alpine on Friday night, October 26th through Saturday morning, October 27th. The annual Spooky Campover at this world renown non-profit animal sanctuary is a family favorite. Enjoy pumpkin carving, s’mores, campfire songs, special animal feedings and more. A costume contest will be held Saturday morning, followed by a special feeding visit to watch the big cats and bears enjoy their pumpkin treats. October 5, 2018 (El Cajon) -- In his latest campaign piece titled "The Lies vs. The Facts", El Cajon Councilman Kalasho has made claims that are so outlandish that most can best be described as detached from reality. He urges voters to "don't believe what you hear in the press," despite well documented news articles in East County Magazine, the San Diego Union-Tribune, the Reader, and multilple network TV stations on his actions. His piece derides as “fake news” reports that he is guilty of wrongdoing and fraud, faces sexual harassment claims deemed true by a judge, is accused of threatening people with an attack dog, is under investigation, and paid business fines. October 5, 2018 (El Cajon) -- The peaceful strains of Kumbaya between San Diego activist Mark Lane and El Cajon Councilman Ben Kalasho could be over. East County Magazine has exclusively learned that Lane’s attorney, Cory M. Briggs, is planning to inform Southern California U.S. District Federal Court Judge Jeffrey T. Miller that Kalasho is continuing to block Lane and others from his Facebook page in spite of a settlement agreement signed last week between Lane and Kalasho that he would stop the practice. September 7, 2018 (Lemon Grove) -- Shortly after midnight, sheriff's deputies saw a man and woman inside a vehicle parked in the middle of the street in the 7400 block of Pacific Avenue, in Lemon Grove. When the deputies investigated, they found the man bleeding from what a witness described as a gunshot wound, says Lt. Rich Williams with the Sheriff’s homicide unit. Deputies called for Lemon Grove Fire Department personnel to assist and began providing first aid. “The man was seriously injured and soon stopped breathing. Deputies performed CPR until relieved by fire department personnel,” says Lt. Williams. However dDespite lifesaving efforts, the man was pronounced deceased at about 12:39 a.m.
August 1, 2018 (El Cajon) – Houda Al Sidnawi arrived in the United States in 2016 with both of her parents and her two younger sisters, now 16 and 10. The family left Syria in 2012 at the brink of the civil war and immigrated to Egypt where they obtained appropriate documentation to enter the United States on refugee visas. Updated March 31 with Councilman Jones' comments. March 26, 2018 (Lemon Grove) -- Last week, many Lemon Grove residents were surprised to hear a citizen speaking during public comment at a City Council meeting reveal that the city had settled a case filed by a former contracted city worker. The worker alleged that Councilman Jerry Jones and City Manager Lydia Romero violated his free speech rights and retaliated against him for comments he’d posted on social media criticizing Jones. East County Magazine has obtained a copy of the settlement and release agreement from the city in response to a public records request. November 18, 2017 (Rancho San Diego)--San Miguel Fire District along with Heartland Fire Rescue and Santee Fire Department will be conducting fire and rescue training this weekend at Vahalla High School, located at 1725 Hillsdale Road in the Rancho San Diego area of unincorporated El Cajon. The fire rescue drill will be Saturday November 18 and Sunday November 19 from 9am to 3pm. Smoke machines will be used during training - neighbors might see smoke coming from the school during these training events. August 29, 2017 (El Cajon) -- The El Cajon police officer who fatally shot an unarmed black man last year will still have to face a civil lawsuit filed on behalf of Richard Olango Abuka, the father of the shooting victim, according to a San Diego Union-Tribune article published on August 25. At the same time, U.S. District Court Judge Cynthia Bashant dismissed the City of El Cajon from the case, saying that there was not enough evidence to argue that the department’s policies or decisions may have in some way contributed to Alfred Olango’s death. January 5, 2016 (La Mesa) – At a packed meeting yesterday, Helix Water Board members aired differing views on how to fill a vacancy left by the resignation last week of newly elected member Lu Tejeda. Tejeda cited conflicts of interest raised by his job with a contractor. The new board majority pushed to appoint Dan McMillan, whom Tejeda narrowly edged out by just 185 votes in the four-man race. Both ran on a platform of reigning in rising water rates. Director DeAna Verbecke dissented, calling for the district to accept applications and conduct interviews with all interested parties in an open meeting before making an appointment. September 30, 2016 (El Cajon)--Demonstrations continued overnight in El Cajon over the killing of Alfred Olango Tuesday by police. After receiving several 911 calls of 50-70 protesters blocking cars and breaking car windows, police declared an unlawful assembly. 10 News reports that tear gas and pepper balls were deployed by police. The station posted video of the incident and reported that protesters also knocked a motorcyclist off a motorcycle. Glass bottles were also thrown at officers. Two arrests were made, according to police. “A large group of demonstrators marched through the streets throughout the evening and into the early morning hours,”said Lieutenant Rob Ransweiler. Jonathan Goetz also contributed to this report. September 28,2016 (El Cajon) –Amid mounting tensions and protests this evening, El Cajon Police released updates in yesterday’s fatal shooting of Alfred Okwera Olango. The updated information reveals the Olango, an El Cajon resident, drew a vape smoking device from his pocket and pointed it at officers. The release also indicates a Psychiatric Emergency Response Team was unavailable due to being dispatched to another call. A 10 News investigation found Olango had a criminal record including a 2005 arrest in Colorado as a felon in possession of a firearm—a semi-automatic pistol in the vehicle he was driving. He also pled guilty to receiving stolen property and driving under the influence in 1999, as well as selling cocaine in 2001. In this confrontation, however, Olango did not have a gun or any other weapon. The Ugandan refugee who came to America after death threats to his famliy was shot and killed after his sister called officers for help due to her brother's erratic actions. Tonight, crowds clashed with police. While organizers of a march and vigil sought to keep the peace, some protesters reportedly threw bottles at police and chased a counter-protester wearing a Trump hat after he shouted racial slurs. June 27, 2016 (El Cajon)—Last Tuesday, the City of El Cajon adopted a new annual budget, announced its participation in the East County Homeless Outreach Team and recertified its Property and Business Improvement District. Updated March 31 with new info from the County Office of Education. March 15, 2016 (San Diego’s East County) – The County Committee on School District Organization will hold six hearings to get public input on the Grossmont Union High School District’s proposed shift to electing governing board trustees by districts. The GUHSD board voted 4-1 to adopt a controversial map and seek a waiver of a public vote despite opposition from members of the public who spoke, some alleging gerrymandering to oust a dissenting board member and break up a vocal minority voting block, as ECM reported. The six hearings are set for March 17 in La Mesa, March 28 in El Cajon, April 4 in Alpine, April 5 in Jamul, April 6 in Lemon Grove, and April 11 in Lakeside. The public can testify at the meetings and also submit written comments up until April 7. The County’s committee will vote to approve or disapprove the district’s request at its April 13 meeting. The Alpine hearing was added after ECM and community members asked that Alpine be added as a location due to the many controversies involving the Alpine area. For the full schedule of meetings, rules and details, click "read more" and scroll down. To view the San Diego County Office of Education hearings announcement in English, Spanish and Arabic, click here. To view data on the GUHSD redistricting plan including demographic details and maps, click here. September 1, 2015 (La Mesa) – The delights of the summer are concluding to be supplanted by a rich selection of community offerings for fall. The final performances of the theater and concert season are joined by a variety of classes for every interest, a health fair, a craft fair, e-waste recycling, and outdoor nature and recreation activities galore. The La Mesa Police Department has been awarded a $34,363 grant from the California Alcoholic Beverage Control (ABC) to battle alcohol-related crime. This is important to the City of La Mesa in order to increase protection for youth and to keep our community safe. August 14, 2015 (La Mesa) -- Applications are being accepted for several openings on the City’s Aging and Veterans Commission, Environmental Sustainability Commission, La Mesa Community Parking Commission, and Historic Preservation Commission. August 3, 2015 (La Mesa) – Whether or not there will be an Oktoberfest 2015 is in the hands of the La Mesa Village Merchants Association (LMVMA). On Tuesday, the Council voted 4-1 to grant conditional approval for this year’s Oktoberfest, with Council member Ruth Sterling voting against. The deal requires the LMVMA to pay all outstanding debt plus a 25% security deposit and meet a scheduled list of new requirements giving the City oversight of LMVMA’s outside contracts for the event, before an Oktoberfest permit will be issued. If all deadlines are met, Oktoberfest 2015 will be smaller and shorter: two days instead of three, closing an hour earlier, and held only in the downtown area east side of Spring Street. However, if any deadline is not met, Oktoberfest will be automatically cancelled with no further Council action required--and no refunds. August 2, 1015 (La Mesa) -- Yesterday at approximately 8:42 p.m., the La Mesa Police Department received a report of a pedestrian that was struck by a vehicle in the 7500 block of El Cajon Boulevard. The pedestrian/victim (61 year old male) was walking across westbound lanes of traffic when he was struck by a 2-door sedan. The driver of the sedan remained at the scene and was cooperative with the investigation. Alcohol was not a factor in the collision. August 1, 2015 (La Mesa) – What a vibrant community we live in! August boasts five free concerts, three free movie screenings, two theater productions, the annual Helix High All Class Picnic, and the annual heART of Mt. Helix. 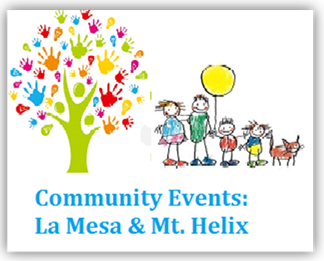 There are free clubs for every age and interest at the La Mesa Library, a broad range of activities at the La Mesa Adult Enrichment Center, and a number of classes at the La Mesa Community Center start in August. For those who love nature there are a number of activities as Mission Trails Regional Park and the Water Conservation Garden, and for the fitness oriented there are several walking groups, aquatics, and even a boot camp. Get out and find your bliss, and while you’re at it meet your neighbors. July 18, 2014 (La Mesa) -- There are numerous power outages right now around the county, including San Carlos, El Cajon City Heights and Poway. June 9, 2015 (La Mesa) – Although the City Council sent them back to the drawing board with a requirement that means they must come up with a repayment plan for $37,229 they owe the City before any new special event applications from them will be processed, the La Mesa Village Merchants Association yesterday evening sent e-mails to all 2014 Oktoberfest vendors soliciting applications and payments for booth rentals for a 2015 Oktoberfest. The Merchants group owes the City $33,996 for Police, Fire and other support services provided for the 2014 Oktoberfest, and said at the last City Council meeting that they’d spent the revenue from it on Christmas in the Village instead of paying back the City’s General Fund. The e-mail gives the vendors a date, time, fees for booth rental (ranging from $500 for crafters up to $2,100 for food vendors plus $100 cleaning deposit), and where to send their checks, but does not mention the debt issue or problems with their previous application which triggered a City Council policy change regarding special event applications and permits. May 26, 2015 (La Mesa) -- The annual pancake breakfast is stacked up to be a fun time for the whole family, Sunday June 7 from 8:00 a.m. to noon at the La Mesa Fire Station #11 in the city's civic campus (8034 Allison Ave, La Mesa). May 20, 2015 (La Mesa) -- The American Flag will be flown proudly at the 18th annual La Mesa Flag Day Parade on Saturday, May 30th. The parade will begin at 10:00 a.m. led by the United States 3d Marine Aircraft Wing Band through the downtown La Mesa Village. Enjoy this year’s Grand Marshal: Sharp Grossmont Hospital Celebrating 60 years in La Mesa. View the many floats, military vehicles, active and retired war heroes, equestrian units, service clubs, and youth groups. Arrive early to see two pre-parade concerts, La Mesa Middle School and Parkway Middle School bands, at 9:00 a.m. along the La Mesa Boulevard parade route. PARK STATION: WILL THE THIRD TIME BE A CHARM? May 14, 2015 (La Mesa) -- Park Station is coming before the La Mesa Planning Commission for the third time since the application was first submitted in 2008. The hearing will be held on May 20 at 7:00 p.m. in City Council Chambers. The first time it was kicked to the curb on the basis of height and density. The second time everyone -including the applicant- was stunned when the American Legion Hall withdrew their co-application during the hearing, requiring the Kitzman’s to come up with a new plan. Read more about PARK STATION: WILL THE THIRD TIME BE A CHARM? By Jack Haworth. Photos by permission of the artist, Kim Stringfellow. Professor Kim Stringfellow of the School of Art + Design at San Diego State University has been awarded the 2015 John Simon Guggenheim Fellowship for her latest research project called, The Mojave Project. Of the 3,100 applicants this year, the Fellowship awarded 175 recipients an average of $43,000 each to assist them with their work. May 6, 2015 (San Diego) -- San Diego State’s School of Public Affairs will analyze existing traffic stop data gathered and provided by the San Diego Police Department for 2014 in an effort to understand the relationship between race, age, and gender on the likelihood and outcome of being subject to a traffic stop. The research project is the first of its kind to include interviews with stakeholders, members of the community, and members of the police force. EDCO Waste & Recycling Corp.
May 5, 2015 (La Mesa) -- The La Mesa City Council voted 5-0 April 28 to issue a public notice of a possible rate increase for both residential and commercial trash pickup in La Mesa. The public hearing will occur at the June 23 City Council meeting in the 7:00 p.m. time certain slot for hearings. EDCO President and CEO Steve South made the presentation to the Council. The company is requesting 3.6% and 1.5% increases for residential and commercial, respectively. That translated to a 68-cent increase for residential from $19.09 to $10.77, and an increase of $1.45 from $99.29 to $100.74 for commercial. 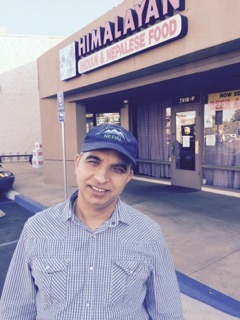 May 3, 2015 (La Mesa) — Himalayan Cuisine, on the corner of El Cajon Blvd. & Baltimore Dr., 7918 El Cajon Blvd. #P, La Mesa, 91941, will hold two fundraising events next week to help raise funds to aid victims of the devastating 7.8 earthquake and subsequent aftershocks that struck Nepal on April 25. The lunch and dinner events will be held Tuesday, May 5 and Thursday, May 7. The $10 lunch will be served from 11:00AM - 3:00PM on both days, with $5 of the fee going directly to help survivors in Nepal. For dinner, a small $2 donation can be added to the bill to assist in relief efforts. If you can’t make it for the fundraising events, you can still drop by any day to donate and say hello.